President Muhammadu Buhari, Deputy Senate President, Ike Ekweremadu, Enugu State Governor, Rt. Hon. Ifeanyi Ugwuanyi, Special Adviser on Media and Publicity to the president, Mr Femi Adesina, were yesterday, conferred with various chieftaincy titles by the traditional ruler of Agunese Afam Mmaku Autonomous Community in Awgu Local Government Area of Enugu state, Igwe Cyprian Maduabuchi Nevobasi (Ogilishi Igbo). Adesina, who represented President Buhari on the occasion, said there is need for Nigerians to build cultural bridges of unity across the country. 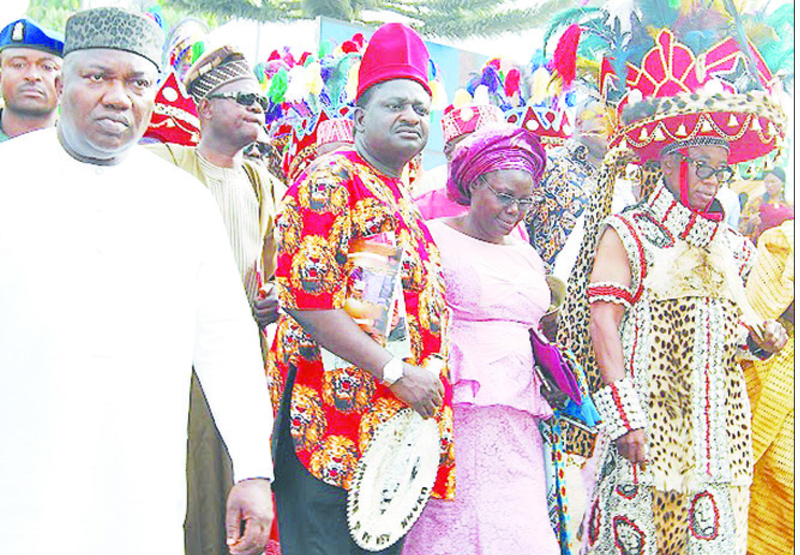 An elated Adesina said that he was conferred with a traditional chieftaincy title outside his ethnic group showed that Nigeria would remain an indivisible entity no matter any situation. “I’m delighted for two main reasons. One is that the honour is completely unsolicited; two, it came outside my ethnic stock. So it shows me that in Nigeria, we will remain one, no matter what. This country will remain one,” he stressed. Igwe Nevobasi, in his speech disclosed that the occasion marked his 14th year on the throne of his forebears and first grand Ofala festival he has held. Igwe Nevolisa said the personalities selected for the award were Nigerians who represented the three major tribes of Igbo, Hausa and Yoruba in the country. “This is part of our measure of contributing to the support of one Nigeria. “We also pray for our president and governor and our leaders in various positions of authority to ensure unity of our country Nigeria,” he said.